Heywood, County Laois has featured here before (See To Smooth the Lawn, To Decorate the Dale, May 12th 2014), the focus on that occasion being primarily the terraced gardens designed by Edwin Lutyens in 1906. However, both Lutyens and his client, Colonel William Hutcheson Poë, did not start with a virgin site. On the contrary, they were working within a landscape that had been carefully laid out more than a century earlier. The main outlines of the estate here were created by Michael Frederick Trench, son of the Rev. Frederick Trench. Of French extraction, the first of the family arrived in Ireland in 1631 and purchased the land and castle of Garbally, on the outskirts of Ballinasloe, County Galway: ultimately this line would become Earls of Clancarty. 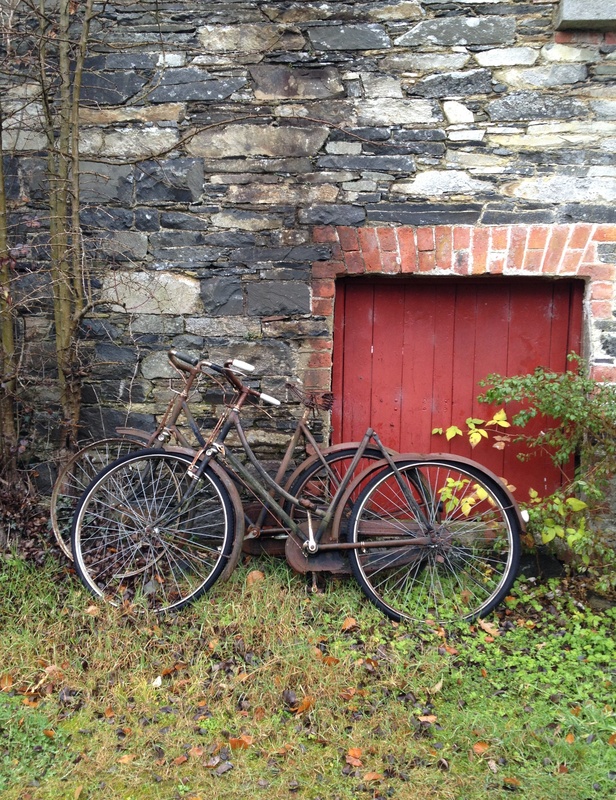 In the early 18th century, a younger son William Trench settled in Laois and acquired land there which was initially developed by his heir, the Rev. Frederick. The English antiquary Owen Brereton wrote of the property in 1763, describing it as ‘a sweet Habitation’ with ’24 Acres Walld round 10 feet high. The ground naturally in fine Slopes and Rising, large trees properly disperst, a River of very clear Water running through it. Pouring Cascades, upon which I counted near 100 Couple of rabbits & 100 of Brace of Hares which are in this Grounds…very extensive Views.’ Both the habitation and the grounds were enlarged by the Rev. Trench’s son Michael Frederick Trench who in 1773 built a new house which he named Heywood after his mother-in-law’s maiden name. A wealthy barrister and amateur architect, Trench is believed to have been primarily responsible for the building’s design although James Gandon may also have had a hand in the work. In 1771 a drawing was shown at the Society of Artists exhibition of the ‘Front of Mr Trench’s house in Ireland…from a design of Mr Gandon’s.’ On the other hand, Sir Charles Coote’s Statistical Survey of the Queen’s County (1801) states that the house was built after Trench’s own plan. A view of the building’s façade (c.1789 and attributed to James Malton) shows it to have been a neo-classical villa: this was engulfed by a much larger house in the late 19th century and the whole was destroyed by fire in 1950. We will probably never know. If Michael Frederick Trench took an active part in the design of his country residence, the same is likely to have been true of landscaping the demesne which then followed. Heywood sits on high ground about a mile from the village of Ballinakill lying to the south-west. Trench laid out the grounds so that they could be enjoyed both from the windows of the house and during a drive or leisurely walk from the building down to Ballinakill. Large earthworks had to be undertaken in order to create a suitable landscape: today the Lutyens terraces (which sit directly below where formerly stood the house) rest behind large buttressed stone walls. 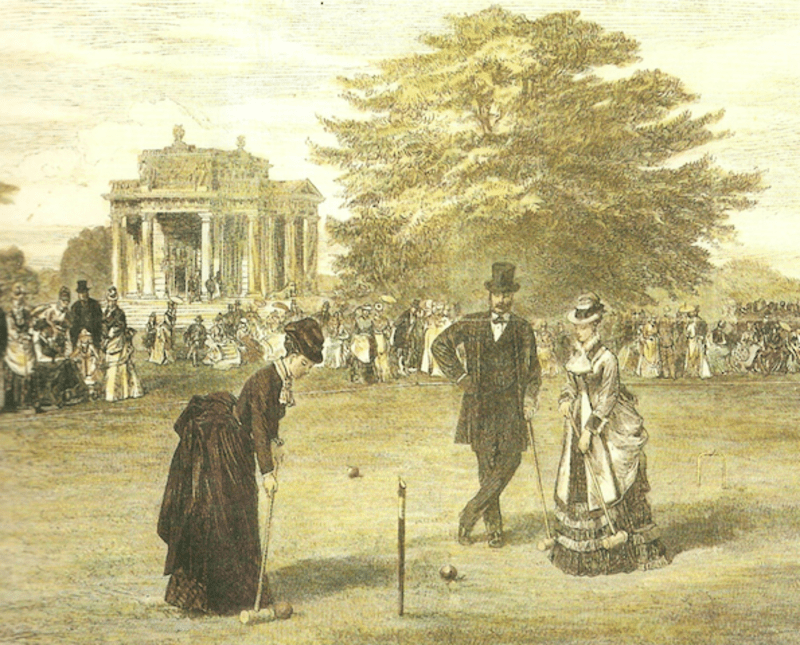 When Samuel Lewis published his Topographical Dictionary of Ireland in 1837, a year after Michael Frederick Trench’s death, he was able to call Heywood a ‘richly varied demesne ornamented with plantations and artificial sheets of water.’ In contrast to the classical severity of the building, the grounds were deeply romantic, and resolutely looking to the past. Setting the tone, the main entrance featured gates set between a pair of Gothic polygonal towers, their rooflines generously castellated. 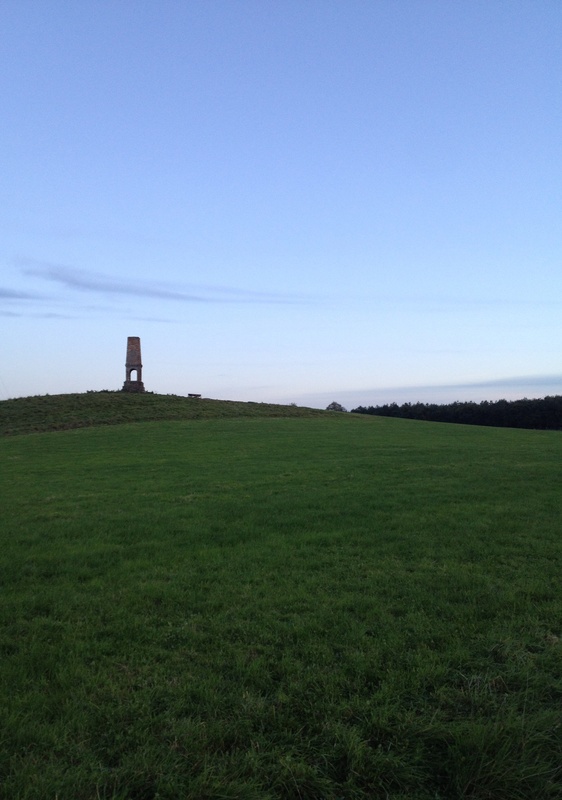 From here the drive winds to the first folly, a slim hexagonal gothic column of limestone column which serves both to commemorate Trench’s close friendship with his distant cousin and fellow-patron of the arts Andrew Caldwell, and also to mark the distance to various locations including Ballinakill and – somewhat further away – Dublin. The column is also close to the point where the first of three lakes rises: these follow close to the line of the drive, with a number of (now over-grown) rustic bridges allowing views down to the village. Moving close to the latter and in contrast to the gothic column one reaches a plain classical gazebo called Claude’s Seat, its name perhaps derived from Claude Lorrain whose pastoral scenes are evoked by the view across a lily-strewn lake. Directly behind the building is a small chamber with the remains of plaster stalagmites on its coved ceiling: this may have served as a hermitage. A mural above the drawing room chimney piece of Mount Ievers Court, County Clare showing the house and its surrounding parkland. Mount Ievers was built between 1733 and 1737 for Henry Ievers to the design of John Rothery who seems to have been a local architect and who died before the building’s completion. Depicting the north facade of the house, the mural is usually considered to have been painted not long after work finished and to be an accurate record of Mount Ievers. Yet a quick look at images of the building then and now shows one crucial difference. In the picture, the entrance is shown as accessed via a horseshoe staircase, whereas today, as can be seen below, a double-flight of stone steps runs directly up to the door. So did the painting show what was intended but not executed, or what was constructed but subsequently altered? (For more on Mount Ievers, see A Place of Magic, December 16th 2013). An admirable pair of stone piers in the grounds of Borris House, County Carlow, ancestral home of the MacMorrough Kavanaghs (once High Kings of Leinster). The original 18th century building, having been damaged during the 1798 Rising, was refurbished some twenty years later in Tudor Gothic style by the Morrisons père et fils. 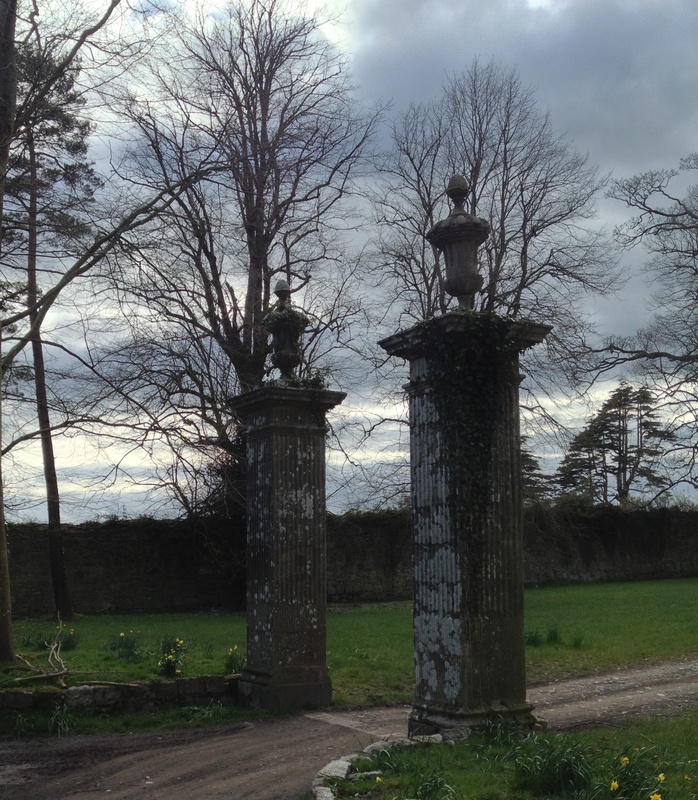 But these gates look to pre-date that overhaul; elsewhere an entrance to the estate features granite ashlar piers topped with ball finials and dates from c.1780. Perhaps these gateposts, grander in scale and splendidly finished with slender urns are from around the same period? 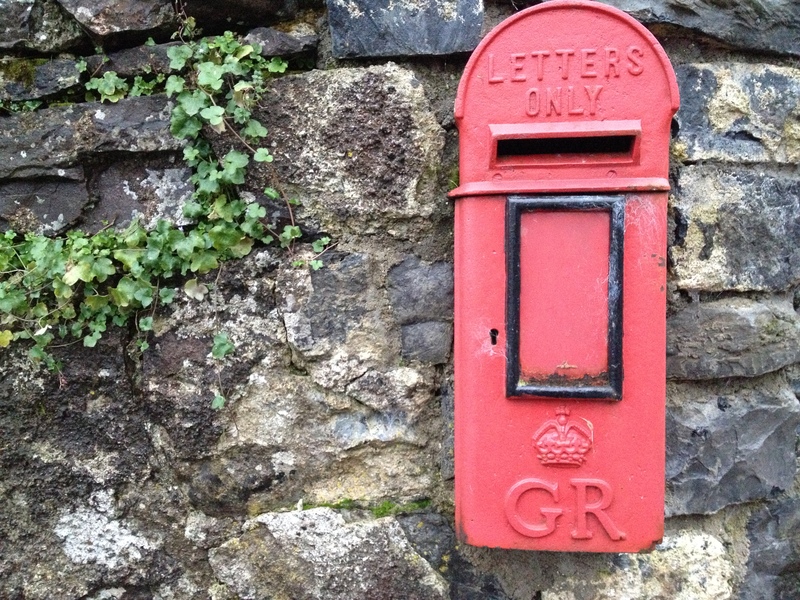 Last year there was a flurry of correspondence in Irish newspapers about the national postal service’s tendency to remove charming old post boxes without notice and substitute drearily standardised replacements. Well here is one that has so far survived the attentions of An Post. Set into a stone wall in front of the former Church of Ireland parish church (now a private residence) in Drumcree, County Westmeath, the box’s two initials indicate it dates from the time of George V, the last British monarch to claim authority in this part of the country.